Dorothy Seckman, 87, of Columbus, died Wednesday, September 7, 2016, at Brookstone Acres in Columbus. Family Prayer Service 10:15 A.M.
A funeral service will be held 10:30 Monday, September 12th at Trinity Lutheran Church, 2205 25th Street in Columbus with Pastor Wayne Nestor officiating. Visitation will be 2-5 pm Sunday, September 11th at Kracl Funeral Chapel, 1622 F Street in Schuyler and 9:30 to 10:30 A.M. with 10:15 A.M. Family prayer service at the church. Interment will be at Columbus Cemetery following the service. Dorothy Louise Seckman was born October 28, 1928 in North Bend Nebraska to Hulda Wiese and William Schmale. She grew up on a farm and loved farm life. She cared for her younger brothers and sisters on the farm during an extended medical absence of her mother. Dorothy worked at Wacha's clothing store in Schuyler and was a member of St. John's Lutheran Church where she was baptized and confirmed. On June 17, 1951 Dorothy married Eugene Seckman. In 1966 the family moved to Columbus where she was a faithful member of Trinity Lutheran church. She saw to it that her children attended church and Sunday school every Sunday and read Bible stories daily to them when they were young. 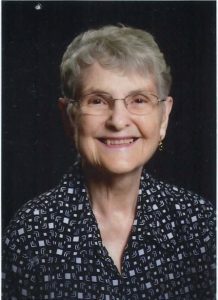 She taught Sunday School and was a member of the Ladies Aid. She was famous for her rhubarb cream pie, requested by family every holiday. Dorothy loved her family and friends. Dorothy is survived by daughters, Mary Seckman and Dory (Harold) Young of Columbus; Jolene (Todd) Connelly of Monroe; one son, Leonard (Wanda) Seckman of Norfolk; seven grandchildren, Justin (Beth) Young, Columbus; Casey (Julianne) Young, Spring Hill, TN; Lance and Travis Seckman, Norfolk; Peyton, Preston and Perah Connelly, Monroe; and six great grandchildren, Jacob, Delaney, Christopher, Leah, Cayden and Ivy; one sister, Mary Ann Bader of Omaha. Dorothy was preceded in death by her husband Eugene; her parents; two sisters, Lenore Callies and infant Lorraine; two brothers, Rudolph Schmale and William Schmale. In lieu of flowers, memorials are suggested to Trinity Lutheran Memorial fund.